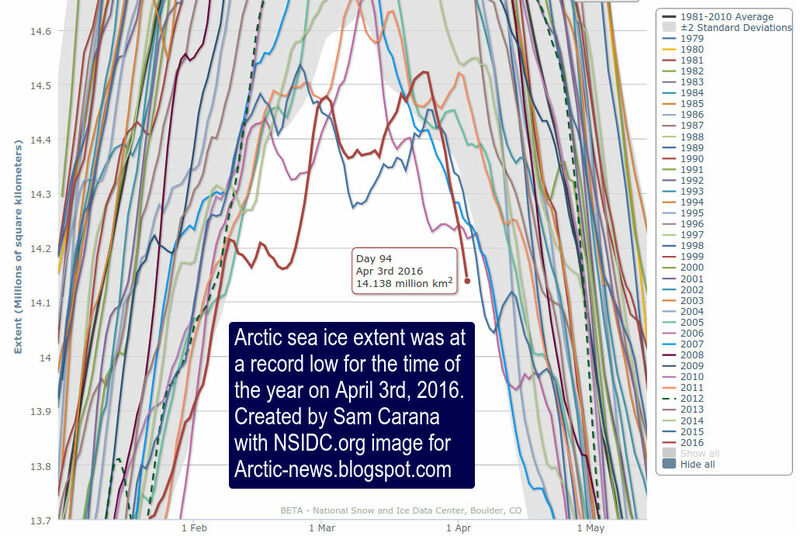 On April 3rd, 2016, Arctic sea ice extent was at a record low for the time of the year, reports the National Snow and Ice Data Center (NSIDC). 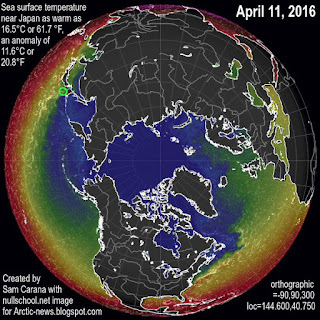 The image below, created with an image from the JAXA site, gives an update on sea ice extent. Besides sea ice extent, sea ice area is important. For more on what constitutes "ice-covered" and what is sea ice extent (versus sea ice area), see this NSIDC FAQ page. Another measure is sea ice area. 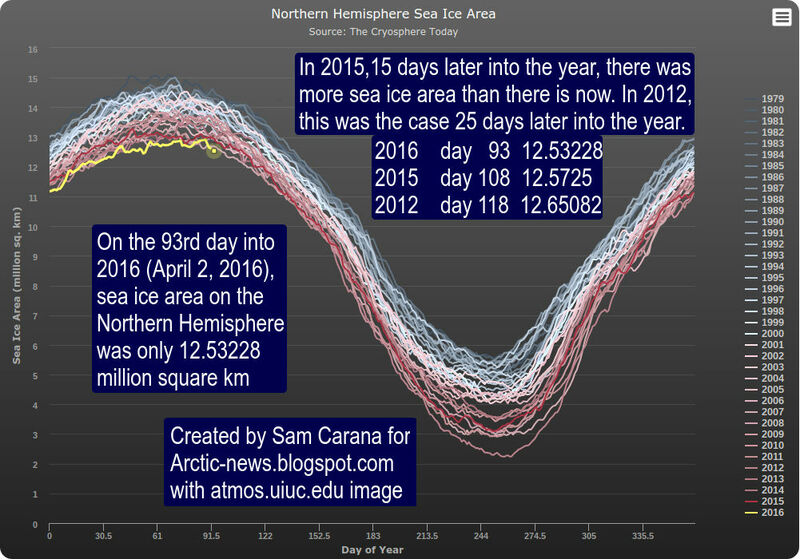 On April 2nd, 2016, Northern Hemisphere sea ice area was at a record low for the time of the year, reports the Cryosphere Today. In 2015, there still was more sea ice area than there is now when it was half a month later (15 days) into the year. In 2012, there still was more sea ice when it was 25 days later in the year. 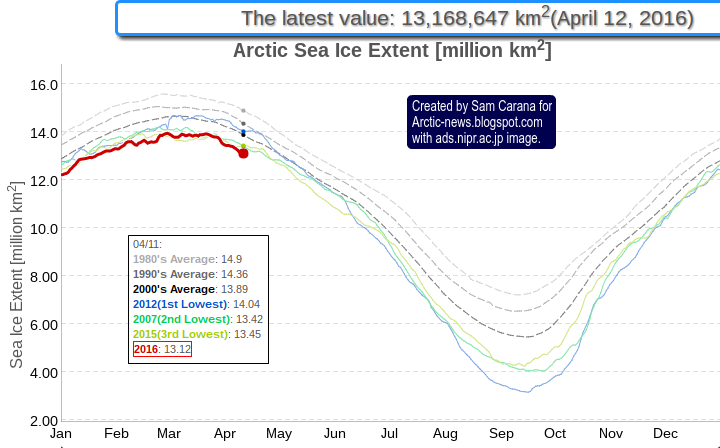 In other words, sea ice area decline is almost one month ahead compared with the situation in 2012. NSIDC scientist Andrew Slater has created the chart below of freezing degree days in 2016 compared to other years at Latitude 80°N. See Andrew's website and this page for more on this. The Arctic has warmed more than elsewhere on Earth. 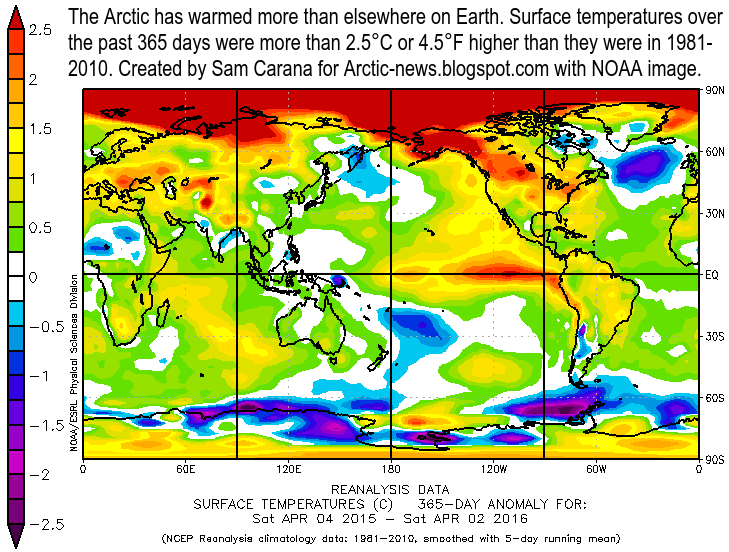 Surface temperatures over the past 365 days were more than 2.5°C or 4.5°F higher than they were in 1981-2010. The image below compares sea ice thickness on April 3rd for the years 2012, 2015 and 2016 (respectively the left, center and right panel). 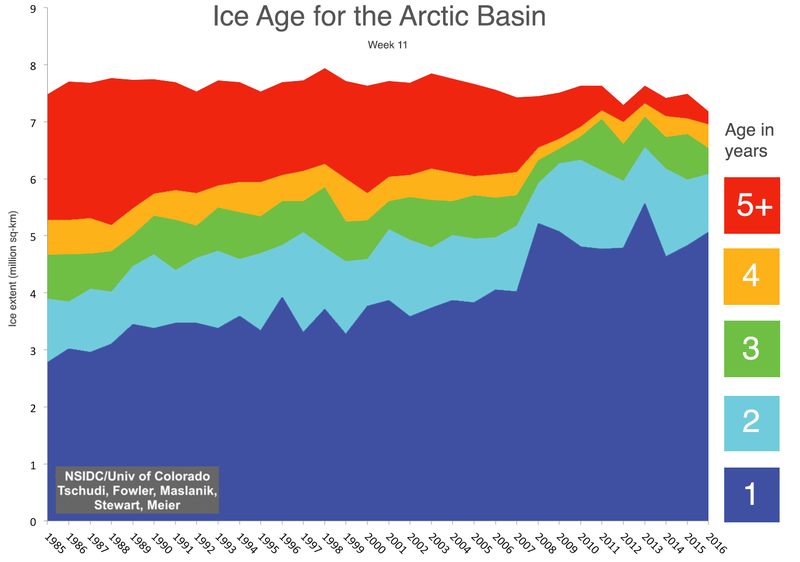 Sea ice thickness has fallen dramatically over the years, as illustrated by the image on the right, from NSIDC, showing Arctic sea ice age for the week from March 4 to 10, from 1985 to 2016. The high temperatures that have hit the Arctic Ocean over the past 365 days make that the outlook for the sea ice in the Arctic this year is not good. As illustrated by the image on the right, the current El Niño is still going strong, with temperatures above 100°F recorded in three continents. The year 2016 is already shaping up as the warmest year on record by far. Temperatures look set to soar over the coming months, over the Northern Hemisphere at large and over the Arctic in particular. The image below shows that over a 90-day period from January 13, 2016, to April 11, 2016, most of the Arctic Ocean was more than 6°C (10.8°F) warmer than 1981-2011. 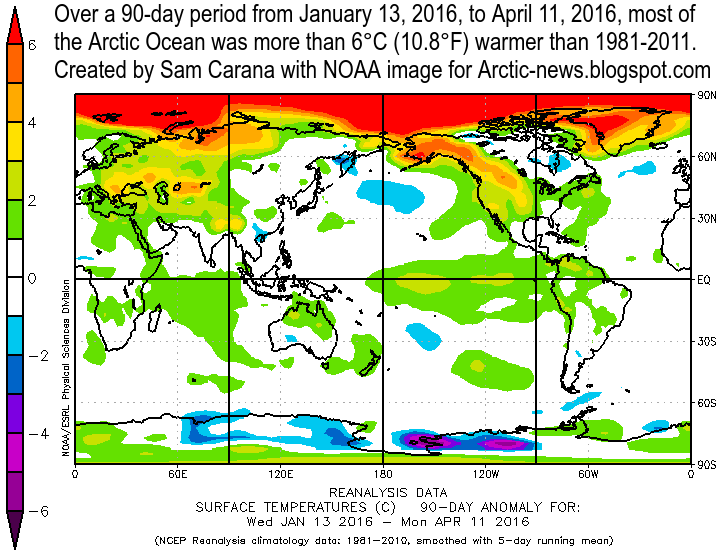 The DMI image below shows recent melting in Greenland up to April 11, 2016. 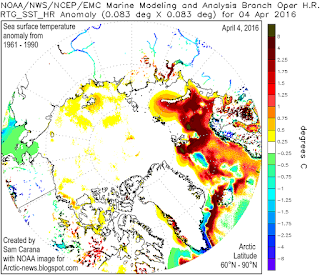 Maps in the left panel show areas where melting has taken place on April 10 and April 11, 2016. The chart in the right panel shows 2016 melting (blue line), against the 1990-2013 average (the vertical axis reflects the percentage of the total area of the ice where the melting occurred). As a recent study confirms, ice sheets can contain huge amounts of methane in the form of hydrates and free gas. Much methane can escape due to melting and fracturing during wild weather swings. 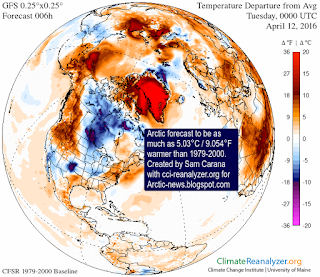 Rapid melting on Greenland looks set to continue. 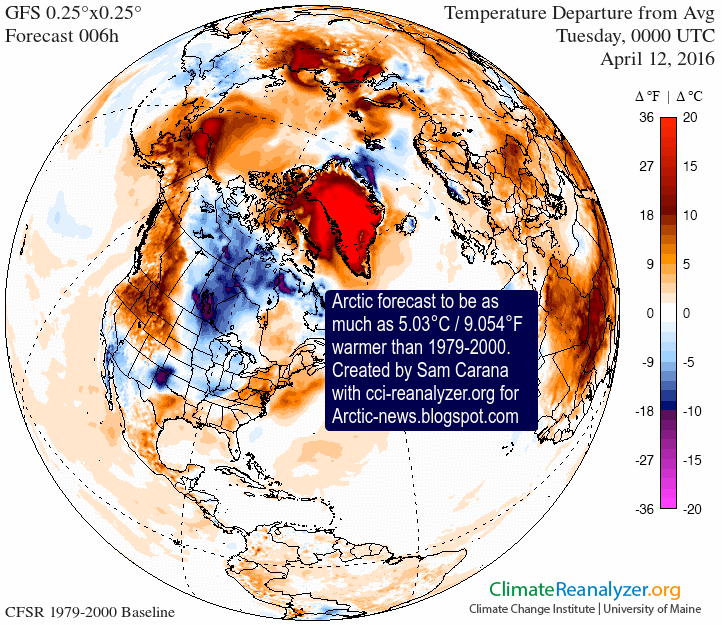 The forecast for April 12, 2016 (0000 UTC), on the right shows temperature anomalies at the top end of the scale (20°C or 36°F) over most of Greenland and Baffin Bay, while the Arctic as a whole is hit by a temperature anomaly of over 5°C (over 9°F), compared to 1979-2000. Furthermore, ocean temperatures are currently very high. These high temperatures, together with the poor condition of the sea ice, make that chances are that the sea ice will be largely gone by September 2016. The image on the bottom right shows sea surface temperature anomalies above Latitude 60°N on April 4, 2016. 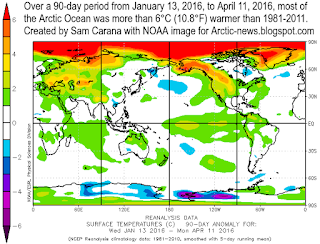 The image below shows that, on April 7, 2016, sea surface in the Barents Sea was as warm as 10.1°C or 50.2°F, an anomaly of 9.4°C or 16.9°F from 1981-2011 (at the location marked by the top right green circle), while there were anomalies as high as 11.3°C or 20.3°F off the coast of North America (green circle bottom left). 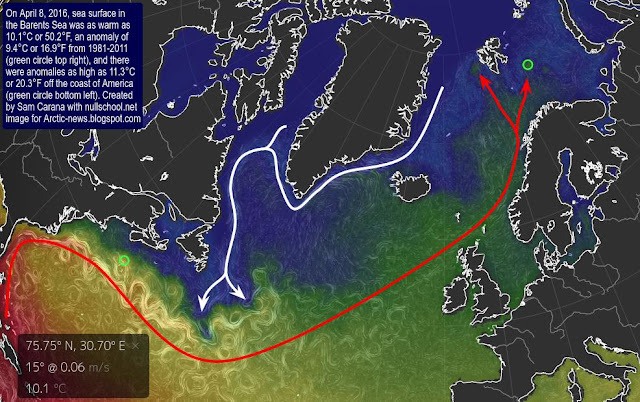 The white line shows the approximate path of the cold exit current, while the red line shows the approximate path of the warm entry current. In the Pacific, sea surface temperature anomalies from 1981-2011 were as high as 11.6°C or 20.8°F near Japan on April 11, 2016 (see image right), giving a further indication of the huge amount of additional heat that there now is in oceans on the Northern Hemisphere. The prospect is that temperatures will rise over the next few months to levels even higher than they were last year (see earlier post on temperatures in June 2015). Sea ice acts as a buffer, absorbing heat and keeping the temperature of the water at freezing point. 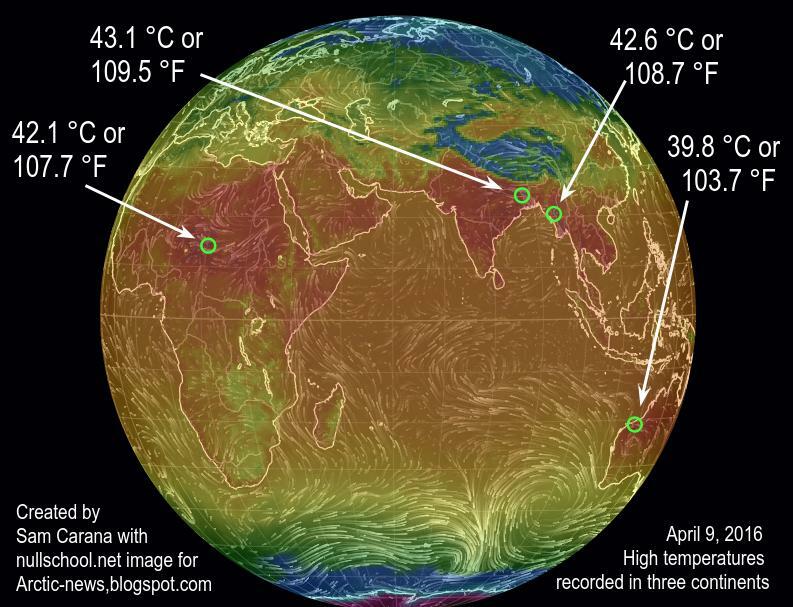 Without such a buffer, further heat will instead make that the temperature of the water will rise rapidly. Furthermore, less sea ice means that less sunlight gets reflected back into space and more sunlight instead gets absorbed by the Arctic Ocean. These are just some of the many feedbacks that accelerate warming in the Arctic. Warm water reaching the seafloor of the Arctic Ocean can penetrate sediments that can contain huge amounts of methane in the form of hydrates and free gas, triggering abrupt release of methane in gigantic quantities, escalating into runaway warming, and subsequent destruction and extinction at massive scale. On a 10-year timescale, the current global release of methane from all anthropogenic sources already exceeds all anthropogenic carbon dioxide emissions as agents of global warming; that is, methane emissions are more important than carbon dioxide emissions for driving the current rate of global warming. Above image shows that growth in methane levels has been accelerating recently; a trendline points at a doubling of methane levels by the year 2040. Unlike carbon dioxide, methane's GWP does rise as more of it is released. 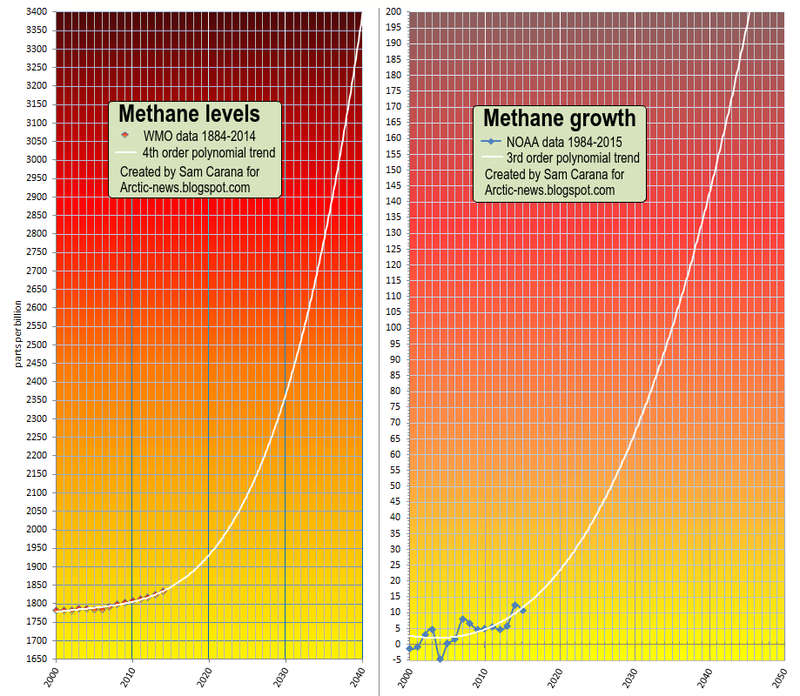 Methane's lifetime can be extended to decades, in particular due to depletion of hydroxyl in the atmosphere. The situation is dire and calls for comprehensive and effective action as described at the Climate Plan. More could have been added from the last National Snow and Ice Data Center (NSIDC) Arctic sea ice report for March, the general outlook for massive sea ice loss because the near-all-time record low marine snow and ice cover is coinciding with near-all-time record low terrestrial snow cover. 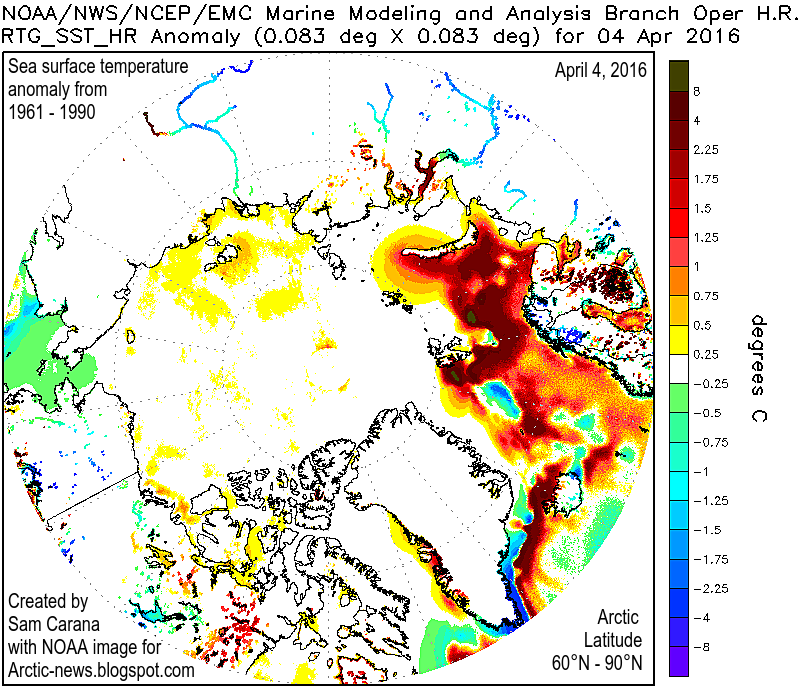 NSIDC forecast that due to dark surfaces being so high, this easily leads to loss of sea ice. In fact, 2016 situation is even worse that it was previous record loss 2012 when snow cover was much larger. Same in 2007 when the sea ice area was slighly smaller, there was much larger terrestrial snow cover. Furthermore, neither 2007 nor 2012 occurred during strong El Nino like 1998. El Nino 2015-2016 is the strongest ever, also accompanied by the very warm Indian Ocean, Atlantic Ocean, and Southern Ocean around Antarctica. At times Antarctic sea water temperatures were also high leading to second smallest Austral summer sea ice at one point. Sea ice area also around Antarctica has been smaller than average most of time, despite increased melt water and reduced salinity - due to high temperatures. All these additional factors should be added into your conclusions without forgetting to mention that the added heat in the earth system is ripping the Polar Vortex apart as the jet streams have started to blend into other irregular atmospheric wind patters. Note also the increased flow of sea ice through the Fram Strait due to lowered spatial viscosity of sea ice that also results from larger wave action, vertical mixing of ocean by wind, thinner sea ice breaking easier apart and collapsing into pack ice, as well as being mostly seasonal ice (containing trace amounts of salts that make the chemical bounds in ice crystals weaker and fragile and melting easier), May be you can update and rejoice on NSIDC's March 2016 report noting all the points therein..
For the record. On 4/5/16, 100 miles north of Norway in the Barent Sea, the water temperature was 42 degrees fahrenheit. I saw a spot where, on April 5, 2016, sea surface temperature was as high as 9.7°C or 49.5°F, an anomaly of 8.9 °C or 16°F, at this location. It makes it hard to get up and plan your day when you realize that the things you are incorporating into your day are not mitigating the ongoing crisis of climate collapse. I can only say that I am grateful that I have no children or grandchildren to apologize to and will likely miss the really ugly end of humanity, by a little. Maybe. It will be unpleasant to be 95 and in the midst of a social collapse due to climate collapse. I just found this blog. wow is all I can say. Very frightening stuff. Can we Design Hydrogen-Fuelled Aircraft?